A flexible, swing-in coating system for occasional and simple applications of dispersion coating on paper and light board as an inexpensive alternative to a full InlineCoater module. Automatically detects and corrects inline even the slightest colour variation, saving makeready time and ensuring constant high printing quality over the entire run. Cold foil technology a new dimension in design and quality of foil printing without the disadvantages of hot-foil stamping such as separate offline process. The indexing function further reduces the foil consumption reducing costs and environmental impact. A completely patented process gives folding cartons three-dimensional and haptic effects. The sheet inspection system detects even the very smallest flaws and impurities on the sheet. Together with the ROLAND InlineSorter for spoil-free delivery piles. The double-diameter sheet turning system ensures consistently high quality and excellent front-to-back register with the lowest mechanical strain on the sheet. This reel-to-sheet feeder permits inexpensive reel materials to be printed on a sheetfed press. For non-stop pile changing at full speed. This can be combined with the InlineInspector for a spoil-free delivery piles. 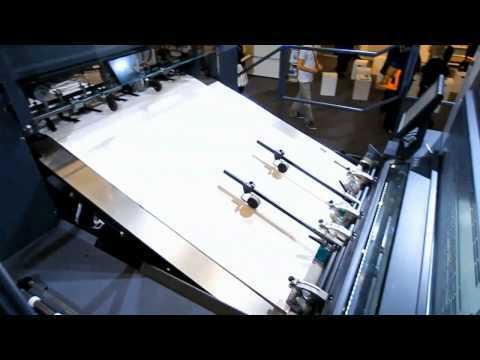 Positioned at the last printing unit to slit down the printed sheet in middle, which enables finishing to be done by using half-sheet equipment.